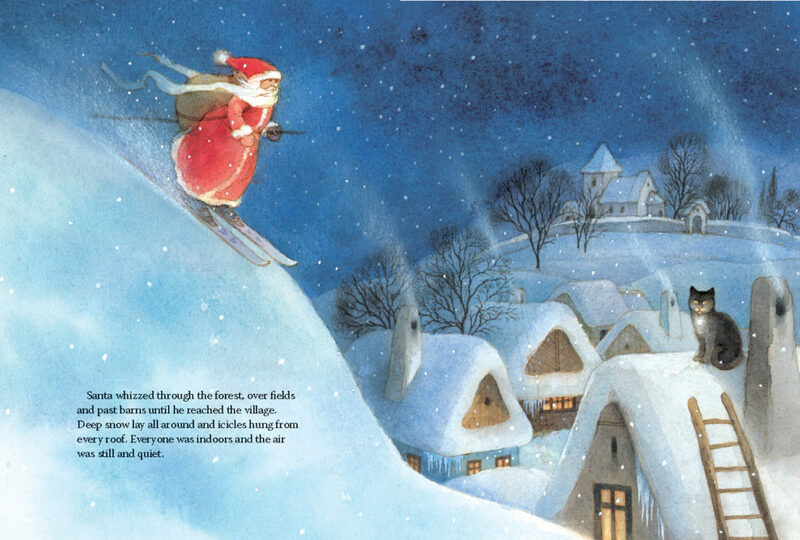 Santa Claus and the Christmas Surprise is a charming story, of hope and community spirit, beautifully illustrated by Maja Dusíková. We asked her about life as a children’s book illustrator, fairy tales, and Santa! Hi Maja, thanks for talking to us today. We’d love to hear about how you became a children’s book illustrator. It all started with my father, really. I still remember how he would sketch things for me and teach me how to do it myself. A rabbit, a little mouse, a rooster, a piglet… He drew them all, but my favourite was always a Christmas tree! We drew so many trees together, both big and small, with lit candles and lots of presents underneath. Our home in Slovakia was always full of books. When I learned to read on my own, the absence of images on my book’s pages really bothered me. So I started to draw in the margins: princesses, kings, dragons and castles inspired by the story I was reading. Those were my first illustrations. I went on to study at the Academy of Arts in Bratislava, where I specialised in etching and book illustration. After graduating, I started illustrating books for both adults and children. Unfortunately, the political climate in Czechoslovakia was worsening after the Prague Spring of 1968. We were under constant police surveillance and I felt a lack of freedom in my creative work, so my husband and I packed a few suitcases and, together with our three children and a caged budgie, drove to Italy. We couldn’t take much with us, but it didn’t matter: I had my artwork and creative ideas securely stored in my mind anyway. Wow, that’s quite a journey! Santa Claus and the Christmas Surprise is such a sweet and original Christmas story. It’s so different from other Christmas stories we’ve read! 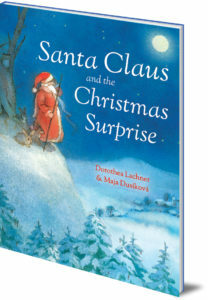 Santa Claus and the Christmas Surprise is one of the first books I illustrated in Italy. I was incredibly excited when an editor from the Swiss publisher NordSud Verlag asked if I would collaborate on a Christmas book. 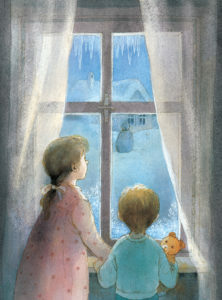 Dorothea Lachner’s beautiful story resonated perfectly with me; I could finally pour my love of Christmas into an actual book! 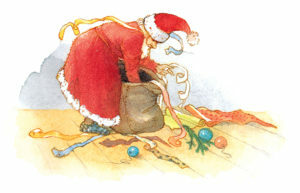 Where did you get your inspiration from when you were illustrating Santa Claus and the Christmas Surprise? I live in Florence now and sadly we never have a white Christmas here. I feel very nostalgic about the Christmas landscapes I remember from my childhood: trees covered in snow, white roofs and streets, everything immersed in a quiet and mysterious atmosphere. Those memories of the magical beauty of Christmas were my inspiration. I get stuck very often, indeed! Sometimes I feel a bit unsure about something, or I am tired, or even afraid of not being able to adequately express on paper what I envision in my head. When this happens, I take a little break, do something else, and clear my head. At the same time, I keep mulling over the illustration I’m stuck on in the back of my mind. Then, all of a sudden, I’ll experience a breakthrough! A light bulb goes off in my head and I can get back to work. Many of the books you have illustrated are fairy tales, such as Rapunzel and The Princess and the Pea. What do you love most about illustrating fairy tales? I love classic fairy tales, because they always have a happy ending. Evil is defeated, good wins, happiness is established. And just as every classic fairy tale can be retold, each illustrator can take a well known story and depict it in their own unique way. In Hans Christian Andersen’s The Princess and the Pea, I was inspired by the humour and I wanted to reflect that in the illustrations. 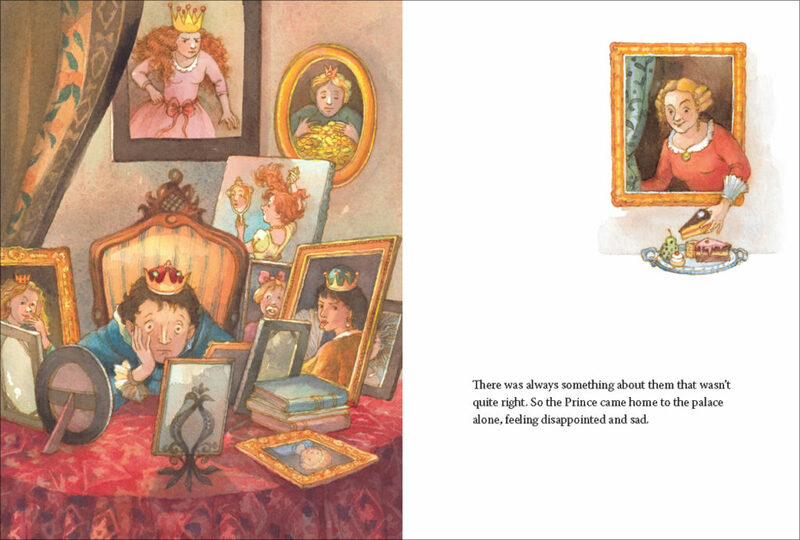 I included tongue-in-cheek details like the portraits of the unsuitable princesses that the prince collected and brought home, or the queen cheating in a game of chess with the king. In one illustration, I even included Hans Christian Andersen himself in the act of jotting down the story with a quill. Yes, and I love it. What matters to me the most is that children like my illustrations. I do what I do in the hope that young readers will pick up on the emotions that I pour into my work. I am very pleased to have won a number of awards over the years. The highlights include the UNICEF award for the best Christmas card, the international Beato Angelico award for women in the arts, and the Most Beautiful Book of Slovakia award. However, the award I cherish the most is the Prix Chronos de Littérature. It is particularly dear to me because the judging panel consisted entirely of 362 children. When you’re an illustrator, you can’t just sit down and paint whatever you fancy. You must be able to draw absolutely everything, so taking the time to research is important! While I was working on the illustrations for Heidi, the publisher invited me to spend some time in Mayenfeld, Switzerland, where the story is set. We even hiked a mountain trail up to Heidi’s grandfather’s house, where I took lots of pictures of the surroundings. This allowed me to illustrate the book in a more authentic fashion. But animals, nature and, of course, Christmas will always be my favourite things to draw! I think that being an illustrator is the best job one can have. Firstly, I am doing what I love most. Secondly, I like the flexibility. Sometimes I will work for days (and sometimes nights) on end, but then I can also take some time off to rest a little, if I need it. I also love the great variety of things I constantly learn in preparation for my work – and I get paid for it too! Lastly, I love the feeling that, as an illustrator, you never really get old – you get to spend all of your time in the company of children and fairy tales! Thanks for talking to us Maja. Santa Claus and the Christmas Surprise is now available, order yours in time for Christmas! Christmas is coming but Anna and Michael’s village is cut off by deep snow. They’re worried that Santa Claus won’t reach them, so they send him a special wish. Santa Claus hears their wish, and brings the village a surprise. Can the neighbours work together to reach their Christmas gift? This is a gorgeously illustrated Christmas story with a dash of traditional seasonal magic from much-loved illustrator Maja Dusíková.